These membranes fit any standard residential membrane housing, so you can UPGRADE to an AquaFX RO Membrane Today! This RO Membrane is rated at 50 GPD (or Gallons per Day) - so that means 50 Gallons in 24 hours. 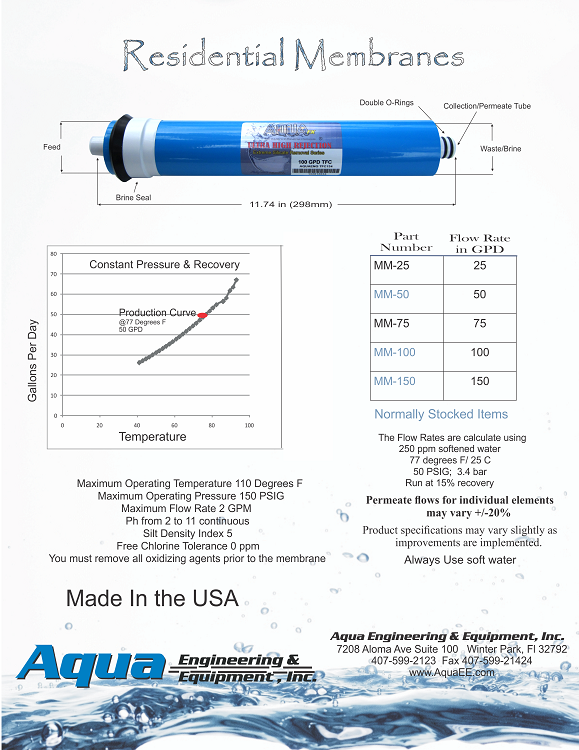 This RO membrane from Aqua Engineering is the longest lasting and most thorough membrane on the market. I have been using this product for years and I am very pleased with the product. Q: How much does the 50 GPD RO membrane weigh? Thanks. Hot Water~ the water temperature must be below 80 degrees F or 26 C also Freezing will destroy a membrane. Insufficient concentrate~ you can run your membrane so that it produces less waste BUT you WILL shorten the life of your membrane.